A lot can change in forty years. 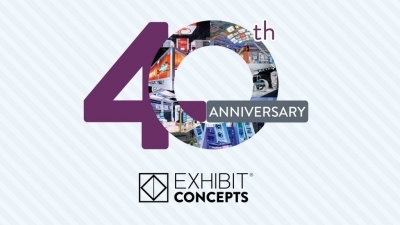 Exhibit Concepts was started by Ned Brown in 1978, born of necessity. Ned showed up one day to work only to realize the doors were chained closed and the company was out of business. It was in that moment, standing outside and realizing his clients’ exhibits were locked inside, that he chose to follow a long-held dream: he founded Exhibit Concepts. Back then, there were just 3 employees working in a single bay of an industrial strip in Dayton, Ohio. There were only a handful of customers. Today, Ned’s daughter Kelli Glasser and over 120 team members collaborate on nearly 2,000 projects annually in a total of 240,00 square feet of space in Dayton and in the Chicago area. Through all those decades and all that growth, one thing has never changed: our commitment to our customers. It is the very foundation upon which our business was built and continues to operate. Our company is full of creative, passionate, and curious problem solvers who blend research, experimentation, and expertise to shape innovative solutions and unique visitor experiences for trade show exhibits, corporate events, interior environments, museums, mobile vehicle tours, and experiential engagement. We believe our clients are the hero of the story, and it’s our job to make them successful. Just as strongly, we believe in the power of face-to-face communication, and its ability to accelerate business growth. In our next forty years, we will continue to evolve as a leader in the exhibitions industry, and we will continue to champion our customers.